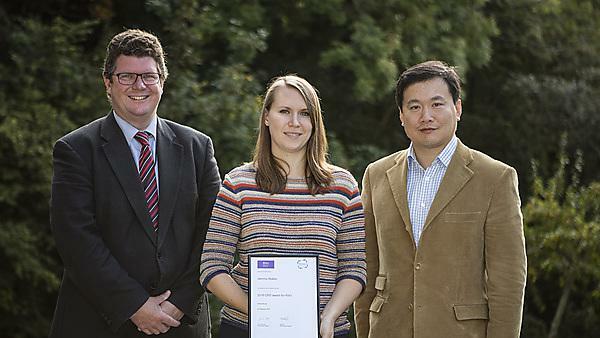 Jemma Walker, a PhD student and dental researcher from Plymouth University Peninsula Schools of Medicine and Dentistry (PUPSMD), has been presented with the Registered Scientist award by the Science Council, for her personal and professional development report. The Science Council deemed Jemma’s report to be ‘exemplary’. This is the second year that the Science Council has run its awards for continuing professional development (CPD). The awards are designed to celebrate the efforts and achievements of our registrants and to offer them recognition for their broad and diverse range of professional activities. In her report, Jemma highlighted the actions she had taken over the previous year to support her CPD. These included activities such as attending the British Society for Oral and Dental Research conference, training new members of staff in technique and theory, presenting her work to colleagues, being part of a Q&A session for new students, and assisting in the production of data and the writing and editing of a research manuscript for publication. Jemma is part of the PUPSMD research group led by Dr Bing Hu. Using teeth, skin and saliva glands as models, Dr. Hu’s research group is performing sophisticated research on cellular and molecular events. These include cells orientating in a specific direction, gene code change and protein-to-protein binding, all potentially impacting upon the regulation of stem cell self-renewal and proliferation. The research group is working on a better understanding of the basic mechanism, so it can be translated and applied to treating human diseases and enhancing tissue regeneration. As part of the work, Dr Hu, working with researchers from China and Switzerland, conducted a first-ever study on the impact that local anaesthetic may have upon tooth cell growth and the development of children’s teeth. Using pig teeth and human young permanent tooth pulp cells, the research identified that local anaesthetics commonly used in clinics can affect the proliferation of tooth cells.